David and Mary are married parents who met while working at McDonald's 10 years ago. David was in the Army and did some traveling while Mary can count on one hand how many times she's been on a plane. This hard-working couple is eager to expand their horizons and see the world. This is from Mary & David's Pike County, Kentucky newspaper. Good Luck May-Day! A Pike County couple will get to travel across the globe and have a shot at winning $1 million as competitors on the “The Amazing Race” television show on CBS this fall. The reality show will feature David and Mary Conley of Stone, the married parents of three children, as one of 12 teams during the upcoming season, the network announced. David Conley is a 32-year-old coal miner and Mary Conley is a 31-year-old homemaker, according to a CBS press release. The network describes the Conleys as a couple who met while working at McDonald's 10 years ago. They say David was in the Army and did some traveling, while Mary can count on one hand how many times she's been on a plane. “We think it is amazing that out of all of the thousands of people who could have been chosen, they were chosen,” David Conley's stepmother, Maddie Conley, told the News-Express yesterday. She said the Conleys live on Mullens Fork Road in Stone. David Conley grew up in Stone, while Mary Cline Conley was raised in South Williamson. Maddie Conley added that the family is very excited for David and Mary. “They'll get to do something that very few people get to do. It is an exciting thing!” she said. The press release says “This hard-working couple is eager to expand their horizons and see the world,” which they will certainly get to do on the show. “The Amazing Race 10” features 12 teams of two on a trek around the world for approximately 30 days. At every destination, each team will compete in a series of challenges - some mental and some physical - and only when the tasks have been completed will they learn their next destination. Teams who are farthest behind will gradually be eliminated as the contest progresses, with the first team to arrive at the final destination winning $1 million. The show will premiere in September on a new night and time, airing Sundays at 8 p.m., according to CBS. Story created Jul 18, 2006 - 19:26:37 CDT. Oh hiya kygirl thank you so much ! Do you know the Conley's ? The Conley's sound like a cool down-to-earth couple! Hope they get along good and aren't a squabbling couple!! Yes Puddin, I do know the Conley's and yes Rudy Rules they are the most down to Earth people. We have been best friends for ever. There is no doubt that America will love this couple. They make friends everywhere they go. Of course all married couples have differences, but Mary don't take ANYTHING from ANYONE. She tells it straight up. They are great parents and very hard workers. They will stop at nothing to get the job ahead of them done. Go May-Day! Wow, that is sooo way cool that you know them personally and have shared this great info with us! kygirl! The May-Day nickname is a clever TEAM name for MArY & DAvid (I bet he's called DAvY in KY!) Looking forward to "meeting" them in TAR in Sept! kygirl, if I haven't said so already... to RFF! We're so happy you joined, and look forward to seeing you often! Thanks RudyRules for the welcome. 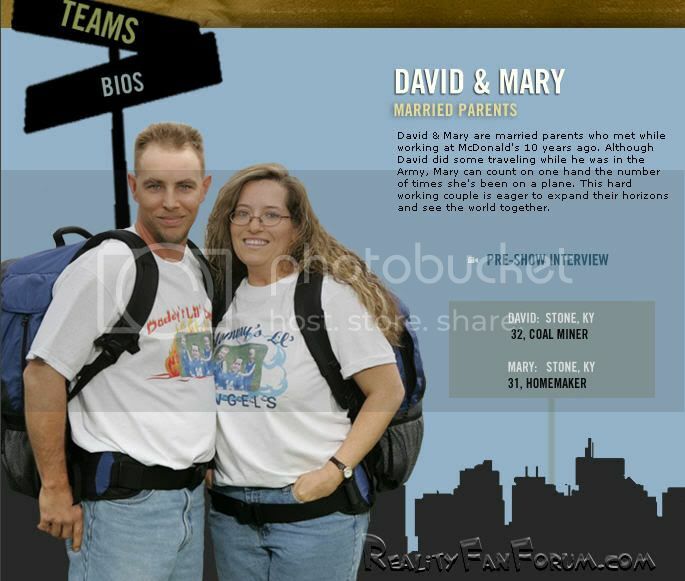 I have came across a couple of closer pictures of Mary & David and just wanted to share.
. Go Mary & David. I changed my name from kygirl to kentuckygirl because a good friend informed me what others may say about kygirl. thanks erwin! I changed my name from kygirl to kentuckygirl because a good friend informed me what others may say about kygirl. thanks erwin! Thanks bunches for the nice photos, kentuckygirl! The Conleys are a good looking couple. So they're BOTH coal miners, huh? Wow, what a life and a dangerous one! Sorry Rudy Rules they both are not coal miners. On Mary's bio it says she is a homemaker. On the link provided the occupation listed for Mary is wrong. Her real occupation is domestic goddess. Which in turn makes her a wife, mother of 3 great children, best friend, nurse, doctor, cook, housekeeper, taxi driver, teacher and many more things but a coal miner she definitely is not. She worries herself sick everyday that David leaves the house until he gets home but she hangs in there. Mary & David I am so proud of the both of you. Hurray for Mary & David !! I love regular people as opposed to actors/models !! I hope the website is up soon ! hey kentuckygirl . . since you know them how about a recap of how you think they did in each show after it airs. Would be nice to have a friend's opinion. No problem. I would love to do a recap of Mary & David after each of the shows. After all, I am their biggest fan! Go Mary & David. I told you they are just your normal everyday people. No surprises there. Of course I love the "Mommy's Little Angels" I am so proud of you both. I am so proud of you Mary & David. I enjoyed your video. Real, normal, everyday people just trying to make their kids and family proud. I am rooting for this couple. One of my two top picks. Somebody buy me a drink! I think David and Mary are going to be awesome! They're one of my top 4 favs.